Settle is an intriguing album title because one would hope that is the last thing that an artist does approaching their debut album, writing and finishing it. 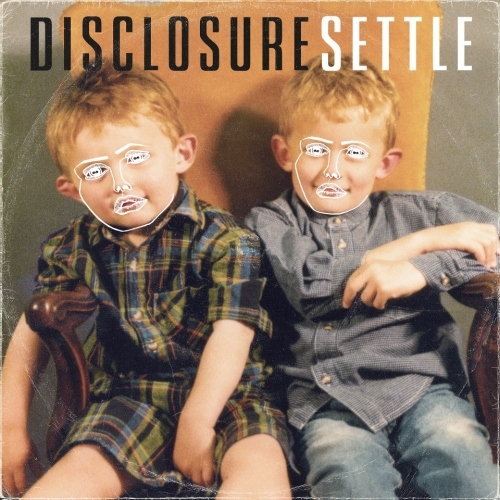 Interestingly that is the name for brotherly production duo, Disclosure’s debut album. Read on to find out what it is that they settle for or if infact the name is all a facade. Like the intro track, the production on album's second song "When A Fire Starts to Burn" is quite good, but the vocal sample does nothing positive to the song. It is quite nice how the intro track leads into "When A Fire Starts to Burn" but that is the best thing about the two songs. I am now at the point to where I cannot listen to the song in full, such is the level of annoyance caused by the vocal sample. The album's third track "Latch" is one of its highlights and should have been the first song on the album. Rather than it beginning with two skippable songs, which it sadly does. Add this song to the growing reasons as to why Sam Smith is great. Songs like "F For You" don't stand out and sound far too similar to proceeding songs. This is mainly due to the production but the vocals (which are sung by Disclosure's Howard Lawrence) don't do anything to excite. "White Noise" is a song that we have become very familiar with in recent months, no thanks to the heavy airplay it has received. It is not Disclosure's or AlunaGeorge's best work but it is satisfactory, in small doses. The concept is probably the best thing about the song; "Just noise/ White noise/ I'm hearing static," Aluna Francis sings on the chorus. "Defeated No More" is a slightly more chilled affair than the preceding songs. Its is fairly ordinary; the vocals are OK and the production's bouncy rhythm does just enough to keep you engaged. "Simulation" does little to stimulate. It sounds like something a DJ early on the bill would play. The fact that it features a sample of Lianne La Havas, does make me like it a little more though. Sasha Keable was a good choice as vocalist on "Voices" as she lifts the song and commands the listener's attention. "Voices" is one of the better songs on the album and is an ideal pick as a future single. Once you've heard a few Disclosure songs then it feels like you've heard them all. While their faithfulness to Garage is commendable their reluctance to evolve the sound is their detriment, as too many of the songs sound similar. The production is Future Garage esque on "Second Chance" and Settle would have been a lot more interesting had it featured more variants of Garage than just the classic Old School sound. "Grab Her" failed to grab my attention, much like Settle's first two songs did. "You & Me" on the other hand is the perfect example of good Garage music. This would have sounded great in Garage's hay day and is just as good in 2013. It's been a while since I last heard anything from Jamie Woon and "January" isn't a bad one to return on. But on the other hand it isn't amazing either. Bass Music's darling Jessie Ware collaborates with Disclosure on "Confess To Me". This will no doubt be one of the tracks that people are most interested in hearing because of that. Despite the interesting proposition of a new song from Jessie Ware and Disclosure, the song is fairly uninteresting - much like the album. Settle's last track "Help Me Lose My Mind" is one of the album's best songs. It's a chilled out House song featuring Hannah Reid from London Grammar, that deserves repeat plays because of how good it is. "Help Me Lose My Mind"
"When A Fire Starts to Burn"
Settle was set to be one of the biggest albums of 2013, based on Disclosure's previous work but the duo have failed to deliver. It would be harsh to describe Settle as bad, but it would be fair to say that the brothers Lawrence have settled for a sound which they have become comfortable with in recent years rather than expanding and building on it. And it is that which is Settle's biggest fault, because all the tools were there for this to be something special. But I guess Disclosure opted to stick with the mantra of if it ain't broke don't fix it. Who can blame them. Settle is available to download now on iTunes and you can stream the album now on Spotify.